No7 - Primer, Foundation & Make Up Base — Sian Victoria. 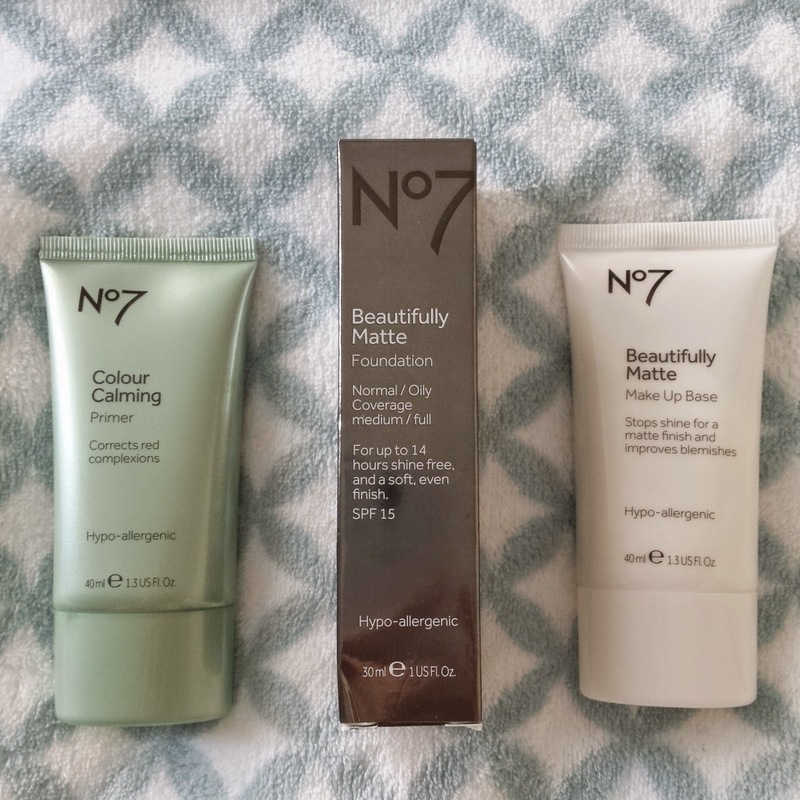 I bought these No7 products recently when it was 3 for 2 at Boots, so I thought I would give them a try as I am a fan of No7 products and have always found their beauty products to work really well. Firstly, the No7 Colour Calming Primer is a green color, it comes out slightly pigmented and you have to be quite quick to rub it on your face as it feels a bit like a sort of clay. After washing my face I do go slightly red as I have very sensitive skin, and it usually takes awhile for my face to go down, so I always use a green product to help me correct my red complexion, I have used lots of other brands for this in the past, but this was my first time buying this product from No7. You have to make sure it's rubbed on properly else you can be left with green patches, the product does work as it makes your skin less red which gives you a good canvas to start applying make-up. As the primer dries quite quickly I would recommend getting a small amount and doing one part of your face at a time. The Beautifully Matte Makeup Base was something I had my eye on for awhile after reading great reviews about it in the past. I would suggest definitely getting your skin shade matched with the clever No7 matching device, as this will prevent you from buying the wrong shade and help you narrow down the best one for your skin as they do have quite a few shades to choose from. If your looking for a Matte foundation and you have oily to combination skin I would definitely give this a try. The foundation isn't too thick or too light and so it gives your face a good medium to full coverage. I found a lot goes a long way, I prefer to keep my makeup light if my skin is clear and spot free, otherwise if my skin is having a bad breakout week then I definitely look for full coverage to conceal my bad skin. I used a stiff makeup brush to blend the foundation into my skin, concentrating on the areas that needed it most, as I do suffer from oily skin I did find that this foundation did make it slightly less oily and it lasted for around 8 hours before I started to notice the difference. It's best if you apply thin layers and build it up. The Beautifully Matte Makeup Base, comes out white and thick, it has a chalky feel but when it gets on the skin it becomes clear. You only need to use a small amount of the makeup base and use it mainly on your t-zone (areas you get most oily) and a tiny bit elsewhere, a thin layer is all you need. The product contains oil absorbing Biopol which will help minimise shine and blemishes without blocking your pores. I found the makeup base a great base to use before applying my make up. I used all three of these products together and my face was considerably less oily compared to usual when I use other products. If you're like me and have oily to combination skin then these products are definitely worth trying out. I do love the dewy foundation look, but when you have oily skin it is probably best to go for a matte foundation, to prevent looking even more shiny towards the end of the day. If you do have oily skin then during the day I would recommend using blotting papers or powders (I use the No7 Perfect Light Loose Powder) as these will really help take away any excess oil and if needed only touch up your make up a little to prevent the makeup looking too cakey. Both the color calming primer and makeup base come in good packaging as they are easy to squeeze out when they are almost empty because the tube is easy to cut so you can use every last drop. It can be annoying sometimes when you have to package and there's still loads left in but you just can't get it out so, with these products you won't have that problem, the foundation also comes in a clear pump so you see how much you have left and be able to use every drop. You may also enjoy reading posts on the No7 Gradual Facial Tan and the No7 Protect & Perfect serum.